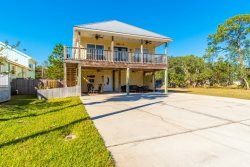 This 3 bedroom 2 bath beach house is located just a couple blocks from the sugar white beaches in the heart of Gulf Shores, Alabama. This unit will comfortably sleep up to 8 guests as it includes a queen sleeper sofa in the living room. The spacious living room and each bedroom is equipped with a flat screen TV so you can enjoy having cozy movie nights in. Beach N Back is just a short walk to the beach where you can enjoy a fun day in the sun! You are within walking distance to many great restaurants and shops including the famous Hangout. Nearby attractions include the zoo, mini-golf, water park, go-karts, charters for fishing and dolphin watching and more! This house also has a covered patio balcony where you can sit and watch the sunrise while enjoying your morning coffee or relax as you watch the gorgeous warm sunsets in the evening! There is beach access between The Lighthouse Condominium and The Whaler. If you prefer to drive and park, there are eight parking spaces available there.